Learn the Quelf rules below. 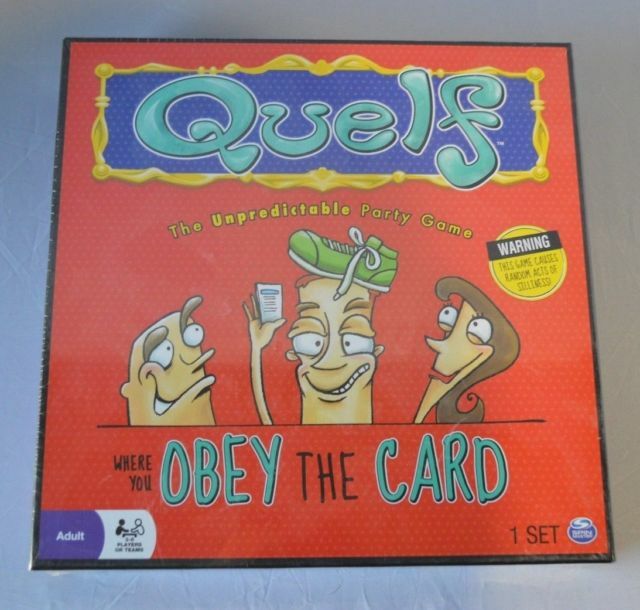 Quelf is a board game that uses a variety of game cards that require players to perform different actions throughout their turns. Some of the cards require physical activity, singing, dancing, and other tomfoolery, while some are as simple as answering trivia questions. The game ends when a player makes it to the last space of the board and does not receive a penalty for the round. Shuffle all decks and place them into the center of the playing area. Keep the pencil, paper, timer, and die handy as well. Choose a game piece to represent you in the world of Quelf. Roll the die to determine who goes first. High roll wins, and play continues to the left. A turn consists of a player rolling a die and moving their game piece forward the corresponding number of spaces on the game board. When you land on a space, draw the color of card matching the space you’ve landed on, reading the card aloud, and doing what it says. If you land on a green space, the player to your right draws the card and reads it to you, and you perform the directions on the card. Each game piece represents a different character in the world of Quelf, and they interact differently with some of the cards. That is, special instructions will apply to certain characters as they progress throughout the game. The attributes of the characters are listed on the side of the box. Penalty–every card lists a penalty. This is the cost associated with failing to perform the action on the card. Timed Cards–Some cards require actions to be done in a limited amount of time. If the action on a card is timed, start the timer prior to beginning the action once the card has been read. Classified Cards–When you draw a classified card, read the card silently to yourself, perform the required action, and discard the card without other players seeing it. Quelf effects might take place if a player sees the classified card. Quelf Effects–Every card has a “Quelf Effect,” which is a special rule, action, bonus question, explanation, or quote from one of the Quelf characters. “Global Roolz”— These cards affect every player in the game. They are played to the center of the playing area. Every player must follow the rule or pay the penalty. “Talking Roolz”— These cards affect only the player who drew the card. The card is placed in front of the player as a reminder of the rule. Whenever the player is caught not following the rule, they must pay the penalty (the card stays in play). Players may have only one “Talking Roolz” card in play at a time. “Action Roolz”— These cards affect only the player who draws them. The card is placed in front of the player to remind them of the rule. If a player is caught not following the action rule, the penalty is applied (card stays in play). Players may only have one “Action Roolz” card in play at a time. Note–at any time, if you want to remove your “Roolz” cards from play, you may do so by moving your character back to the starting space. Quizzle cards are trivia cards with questions ranging from the bizarre to the unanswerable. When you land on a green Quizzle space, the player to your right draws the card and asks you the trivia question. If you answer correctly, you do not face the penalty, otherwise the penalty is enacted. Some Quizzle cards have an “extra credit” question. This question may be answered even if the answer to the first question was incorrect. If you answer the “extra credit” question correctly, move ahead one space. Stuntz cards require you to perform a physical action (like balancing a shoe on your head), while Showbiz cards require you to perform songs, dances, poetry, and the like. If a card states, “Tell other players to guess,” you must get the other players to guess the underlined text before time runs out on the timer. If a card requires you to do something that violates a rule, ignore the rule while the card is being played. Improvise if required items are not available. If this is not possible, draw another card. The Quelf rules state that if a required action cannot be performed safely, another card should be drawn. Scatterbrainz cards are performed by all players. The player drawing the card chooses the topic from the available topics on the card, answers the question, and then play continues to the left, with each player answering the question if able. Continue this process until a player takes longer than 10 seconds to answer or a player gives an answer that has already been stated. The player who fails the activity pays the penalty. The first player to reach the final square and complete the Scatterbrainz question wins the game. Because it is the final square, the player drawing the Scatterbrainz question must give two answers to the question, while all other players are still only required to give one answer. If the player landing on the square is not the player to receive the penalty, they win the game.